Governments test a driver’s vision before giving him a driver’s license, yet there’s no screening for anger issues, constant cell phone use, and other factors that probably won’t come up during a short driving test. We assume that the vision requirement at least makes a difference in safety. New Zealand found differently. Take a look at what’s happening in New Zealand. Like most states in the the US and in some other countries, their requirement is about 20/40 vision. They didn’t feel like they could run an experiment by having people with poor vision not wear glasses while driving, but they did the next best thing by combining two studies that looked at drivers’ safety records retroactively. In one study, they looked at a pool of 7,400 drivers who previously passed the vision test but failed the vision test during their license renewal and started to wear glasses. So in other words they looked at people who had poor vision leading up to the failed vision test, and then comparing their driving record with after they put glasses on. In the next study, they looked at people who, again, previously passed the vision test, but they divided them up into those who failed the next vision test and those who passed. In both studies, none of it made a difference. 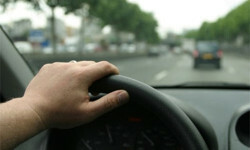 The average accident rates were the same whether people drove with blurry vision or not. As a result of this, NZ is looking at keeping the requirement for the initial vision test but dropping it for renewals. It would save some hassle and shorten the lines (assuming the lines are as notoriously bad as the DMV offices here in the US), without any measurable effect on accident rates. This isn’t to justify driving with bad vision. However, it does bring into question just how useful glasses are at making vision “better” when it comes to a mentally intensive task like driving that requires, for one thing, good peripheral vision. Glasses don’t correct peripheral vision, and people who wear glasses tend to have a amount of tunnel vision to adapt to the glasses. Contacts do correct peripheral vision, but they make it more uncomfortable for a person to move his eyes, which results in less sensing of the visual field and less awareness. Let’s be clear. If you have bad enough vision, there are things you simply can’t see on the road, perhaps depending on the conditions. What people don’t always consider when pushing for strict requirements around things like this is people do have some common sense. If they can’t see, they know it. They tend to slow down, be more careful, and avoid certain situations, just like anything else in life where he knows he needs to be careful. We’ve all found ourselves stuck behind the senior citizen on the road who is going 20mph under the speed limit, probably for a very good reason. My point here is not to recommend that anyone drive with bad vision. I recommend you do what you have to do to stay safe while improving your vision to avoid the issue altogether. The point is, things like these studies help illustrate that while glasses can improve visual acuity, they introduce other vision dysfunctions like tunnel vision and tired eyes, not to mention make visual acuity worse over time. Is that really the best thing for drivers? Very interesting article and something to think about. I learnt about the peripheral vision and what it does when earing glasses in comparison to wearing contact lenses. David, yes! When my vision was much worse than it is now, I’d put my glasses on top of my head temporarily when I was stopped at a traffic light, or when I was crawling through a construction zone. It felt daring and exciting, and I was surprised that I had no trouble seeing at all. In some ways I felt like I could see better! Keep the wisdom coming. Next Next post: Half the world? Not if we can help it.